Overheard at the 0:29 mark: "These aren't real, right?" ...the Portland Children's Museum to see the Dinosaur exhibit at the Oregon Zoo. It was pretty neat and the robotic animals were impressive and definitely scary for the younger kids! This was Day 2 after spending the day at the Portland Children's Museum to tie-dye some T-shirts and the Oregon Zoo to see their robotic Dinosaur exhibit. We stopped at the Woodburn Company Stores outlet mall to exchange a shirt I had bought and went down to Salem for dinner. Service was very good and super fast and the food was delicious! I brought along my Sony GPS data logger again, but I've had some problems matching up the photos with the data. I guess I hadn't used it in about a year and the unit had a hard time syncing with the nav satellites. All the data was offset buy a few hours. I'll try to upload the other pictures when I get a chance. This picture is geotagged but I did it manually through Google Earth. You can view it on the Flickr Map. I bought the Intec Cooling Station for Wii from Best Buy for $10. It's a USB fan that plugs into the back of the Wii and directs air to help keep it cool. I've had success using USB laptop fans to keep my HD-PVR and A/V receiver cool so I thought I would try it with the Wii. It works as advertised, however, it is powered and running all the time. Since it blocks the USB ports in the back, there is one extra port on the side for you to use. I'll have to buy a USB hub because I still need one more port so I can plug the Rock Band drums and a couple of microphones at the same time. The biggest problem with the Cooling Station for the Wii is that it's very noisy. It's not a big deal when you're watching TV or playing a game because it's not noticeable, but when the room is quiet the fan seems very loud. PROS: 6.2L V8 engine with 403 HP; throaty engine rumble; massive cargo area behind 3rd row; HID headlights; LED tail lights; chrome grille; 22" wheels; rear entertainment system with TWO roof-mounted LCD screens; it's an Escalade! 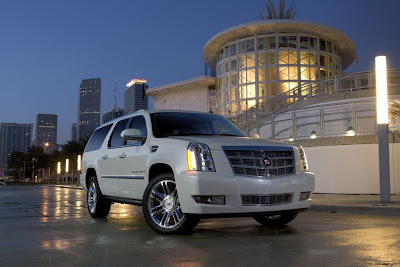 ...there are a lot of used Escalades on the market for significantly reduced prices. That's why I decided to take a look at them. They were redesigned in 2007 and according to the reviews I've read there were a lot of improvements in handling as well as some subtle visual changes. 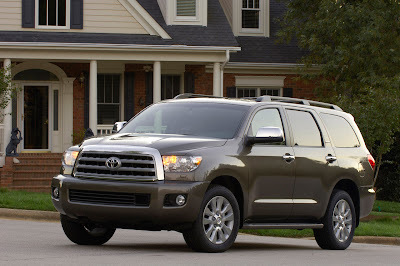 I went back for another test drive of the 2008 Toyota Sequoia Platinum today. It was slightly rainy and we were given a black one (instead of the white we got last time). I'm glad I got to see this colour scheme because it made the interior look way better (less cheap) than I remembered. I also confirmed my initial impressions about the Sequoia's ride quality: the Platinum trim level definitely makes the Sequoia feel much smaller than it really is. The difference in ride quality between it and the Limited is noticeable and significant. ...believe that throttle response was better. It actually fits in our garage! ...a bit barge-like. The interior is finished really nicely though, and the rear entertainment system comes standard with 2 roof-mounted LCD screens. The 22" chrome rims fit the Escalade's image as does the loud rumble of the top-in-class 403 HP V8 engine. When I got home I took the tape-measure out and discovered that with a little re-arranging, we would be able to fit the Escalade ESV completely inside our garage. We also saw tons (literally) of Suburbans (which are about the same size as the Escalade ESV). Originally uploaded by istargazer. I had the our Honda Oddity washed and waxed today in preparation for our road trip next week. And since it was all clean and shiny I decided to take some fresh pictures. After more than a week of sunshine, it clouded over today--a perfect opportunity for me to try some HDR pictures. I know it looks like a fall picture, bur for some reason our Coral Bark maple tree isn't doing so well this year. ...allow me to put the mount on my Suzuki Burgman. Luckily, my point-and-shoot camera fit fine and with a 4BG memory stick I was able to record almost an hour's worth of video. In terms of track time, that meant I could record two full 25 min. sessions. What I like about this type of mount was that I was able to attach it to one of the child tether anchors on the rear shelf without having to make any modifications to the STI. This week I've looked at 3 different vehicles to be possible candidates to replace our Honda Odyssey and Subaru Impreza STI: The 2008 Land Rover LR3, the 2008 Toyota Sequoia, and the 2009 Honda Pilot. In the end, I feel like I've just ended up where I started from. There is no perfect vehicle and choosing one is a matter of choosing which compromises I'm going to be willing to live with. The truth of it is, I think our Honda Odyssey is a pretty good vehicle for us despite my shallowness in refusing to accept the fact that we are a minivan family. Maybe for passenger space it's not the best and it doesn't have 4WD, but it sure excels in cargo space and convenience. (And don't tell anyone, but sometimes I look at our minivan and I think it looks pretty good--for a minivan.) It's really hard to justify making a change in vehicles for only minor improvements in certain areas while giving up things in other areas. When I drove the Platinum, I was quite impressed and stepped out of the driver's seat feeling that I had been behind the wheel of something much smaller. Somehow the Sequoia's massive size was hidden and it didn't ride or handle like the huge truck it was. PROS: Mid-size SUV with 8-passenger seating, improved looks, 4WD traction, well-designed storage area behind 3rd row. CONS: Average handling and performance; Canadian MSRP for Touring trim (NAV + RES) is $10,000 more than US MSRP. Yesterday afternoon I went out to the Honda dealership to show my wife the new 2009 Honda Pilot. This is the newly redesigned 2nd generation that has a controversial boxier look and new grille. A lot of people comment online about how much they dislike (hate) the look, but I like it. PROS: 5.7L V8 engine with 381 HP, firm handling, and 6-speed transmission all hide its massive size; low-gear transfer case for off-roading; space behind 3rd row is enough to fit Peg Perego Pliko P3 stroller. CONS: Massive size; restrictive navigation system; Nav/backup camera only available on Platinum (top) trim line; 8 passenger seating not available on Platinum; [inefficient design of interior space-- UPDATE: I was wrong. After a second look at the 3rd row, it is much roomier that my first impressions]. PROS: Looks, luxury, ruggedness, fun off-road tech gadgets, flexible seating configuration, open "airy" interior, large windows=great visibility, HID headlamps. CONS: Seats tricky to fold and unfold, soft suspension, minimal space behind the third row, reliability(?). What attracted me to the LR3 at first was its looks. I've always admired the new design that was introduced in 2005. The clean modern lines and luxury headlight treatment coupled with its off-road DNA always made it desirable to me. A couple of weeks ago when I first popped in to take a look at it's 7-passenger configuration, I got really excited. Over the years I’ve discovered that I like shopping for cars. I haven’t been able to keep any of our vehicles longer than 5 years before I start getting the itch for something new. And I can see that the cycle is repeating. Over the last couple of weeks I’ve been doing a lot of research trying to find something that could replace both our Subaru Impreza WRX STI and our Honda Odyssey Touring. In the process, I found a site called CarSeek.com. At CarSeek.com you can find an incredible amount of information about all sorts of new vehicles from sub-compacts, sports cars and luxury sedans to latest the cross-overs and hybrids. Each auto manufacturer is represented by model reviews, history, specifications, pricing options, photos, and rebate information. On top of all that information, there are links to the latest automotive news as well as articles about recent trends like electric cars and hydrogen fuel cells.